When I heard that the next game to yank us back into Aperture Science’s bleached-white bowels would be about bridge building, I figured it’d be a skip for me. I just got done playing Bridge Constructor Portal for a few hours, though, and I couldn’t stop smiling. This collaboration between between Bridge Constructor developer ClockStone Software and Valve is about helping tiny transport vehicles get across large chasms. You snap together bridges beam by beam, then press the “drive” button to see if your precarious assemblage of beams and tethers holds up. Also, there are portals. And turrets. And companion cubes. And GLaDOS. The game is a Portal skin for a physics-based bridge construction puzzler, but of all the hollowed out flesh vessels you could crawl into, Portal’s is a strong choice. It’s an especially good one for a puzzle game. While Bridge Constructor’s central premise is pretty far removed from “portal your way through a series of rooms while a homicidal AI passive-aggressively needles at your psyche,” there’s a familiar rhythm to it. Each level introduces a new tool, challenge, or idea that you’re only partially prepared for. Early on, that means basic bridge concepts like support structures, but as the game proceeds through its 60 levels, you start encountering Portal staples like turrets, weighted companion cubes, and of course, portals. Most levels unfold in a way Portal fans will find comfortingly familiar: At first, you’ll probably feel a little lost, but after some experimentation, you’ll develop a faint outline of what you need to be doing. Then, somewhere around your sixth, sixty-sixth, or six hundred and sixty-sixth attempt, you’ll have a eureka moment that makes you feel like a genius. Bridge Constructor’s open-ended levels are nowhere near as good at conveying this feeling as Valve’s precisely calibrated Portal games, but a handful of the puzzles I’ve played have gotten close. Bridge Constructor is, however, better than Portal 1 and 2 at rewarding failure. Levels allow for a variety of solutions—some of them hilariously hacked-together—and it only takes seconds to hit the “drive” button, watch a little NPC driver try to make their way through, see what’s wrong with your creation, and reset. Much of the game’s comedy comes not from GLaDOS’ quips or other references, but from catastrophic bridge failure. Let me give you an example. The setup here—make something fall into a portal from a high place and launch out of another—is classic Portal. It took me a few tries, but eventually I assembled some decent, well-supported bridges, taking care to ensure that the yellow portal wasn’t blocked, and got one vehicle across. However, if you beat a level the regular way, Bridge Constructor then offers you an optional challenge: get a whole convoy of vehicles to the other side of the same level. Sometimes, a bridge you’ve built for one vehicle will do the job for five or seven or ten. Other times, though, repeated stress from multiple vehicles will cause supports to strain and break, or make vehicles crash into each other. You’ll note that the bridge I built nearest to the portal in the above image is pretty slanted. When the lone vehicle first landed on it, it ground to a halt, nearly rolling backward and into the acid before eventually climbing up and making it to the end of the level. This little quirk caused things to unfold very differently with five vehicles in the mix. The bridge sunk and nearly collapsed under all the weight, stopping any of the vehicles from making it the rest of the way up. For some reason, though, while all the other little driver dudes writhed in impotent fear and frustration, the dude on top of the heap wouldn’t stop waving enthusiastically, like he’d made it on TV and was trying to say hi to his mom. It was the funniest thing. I couldn’t stop laughing. I felt good about solving the puzzle, but the best part was definitely when nothing worked and everyone almost died and that tiny doofus wouldn’t stop waving. Oh, and here’s a fun and extremely Portal kicker: if a dude falls into acid and dies, but the vehicle makes it to the end of a stage, you still win. Get ready for some puzzle solutions that are funny, but also hella grim, is what I’m saying. Bridge Constructor Portal is an intuitive, occasionally brain-bending toy box that doesn’t hit Portal’s highs, but also doesn’t sink to the lows I was worried it might. 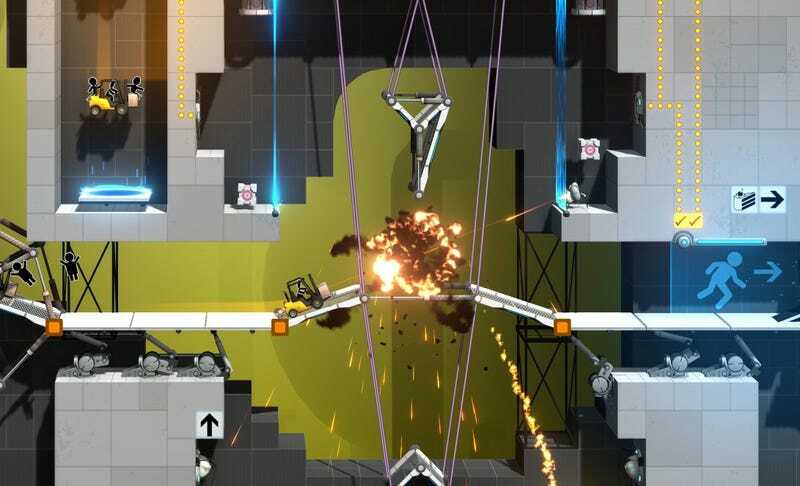 If you’ve got a hankering to solve some puzzles and aren’t still sick of the Portal universe after all the memes it spawned, Bridge Constructor Portal is worth a shot.